Public transportation is recommended. The nearest tube station to Fortune Theatre is Covent Garden (Piccadilly Line); Temple Station (Circle/ District Lines) is also nearby. The Fortune theatre is also well serviced by multiple bus stops and lines including the 1, 4, 6, 9, 11, 13, 15, 23, 26, 59, 68 76, 87, 91, 168, 171, 188, 341, and 521 from Aldwych Kingsway (Stop F), Aldywch Somerset House (Stop R) and Royal Court of Justice (Stop P). If driving to the theatre the nearest carparks are located in Bloomsbury Square and Lincoln’ Inn Field. There is also an NCP underground car park in Parker Street. The Fortune Theatre located on Russell Street, Covent Garden in London, was opened in 1924 and stands on the site of the old Albion Tavern. In 1989 The Fortune Theatre London hosted the long running play The Woman in Black, which was adapted by Stephen Mallatratt from the book of the same name by Susan Hill. The Fortune's original building plans were discovered by Richard L. Hay, who used the exact plans to design and build the Elizabethan Stage at the Oregon Shakespeare Festival in Ashland, Oregon. The Fortune Theatre, once so succinctly described as "This most intimate of theatres" first opened to the public on Saturday, 8th November 1924. Built on the site of the old Albion Tavern, it was the first London theatre to be built after World War I. Its opening play was Sinners which was penned by Laurence Cowen, who commissioned the architect to design the theatre. Unfortunately for Cowen, the play only ran for two weeks. Over the course of the following years, there were many other productions at The Fortune Theatre, including some amateur work in the 1930s. World War II even saw the venue being used by ENSA, the concert party corp of the Forces. Since then of course, the Fortune Theatre has seen many celebrated actors and actresses perform on its stage. Amongst the impressive roll call are Dame Judi Dench, Dirk Bogarde and Maureen Lipman, who famously portrayed the late Joyce Grenfall in her one woman show, ''Re-Joyce''. Variety stars Flanders and Swann played here and The Fortune was home to the ground-breaking revue from Cambridge, Beyond The Fringe. That run saw the original line-up of Alan Bennett, Peter Cook, Dudley Moore and Jonathan Miller perform together. Other shows that ran here include Mr Cinders, Double Double, Nunsense and Dangerous Obsession. The Fortune Theatre Russell Street is most closely associated, of course, with its current production The Woman In Black which has become a West End legend. This enigmatic and brilliant play first took up residence at The Fortune in 1989. The Woman In Black celebrated 5000 performances at The Fortune Theatre in July 2001 with a huge party, which was held in the Stalls Bar and the auditorium! Everyone present agreed that it was a most unforgettable and enjoyable occasion. For many years, The Fortune was privately owned, but in December 2001, it became part of the hugely successful Ambassador Theatre Group and joined ATG's nine other West End theatres. Fortune Theatre London tickets are available for Woman In Black now! 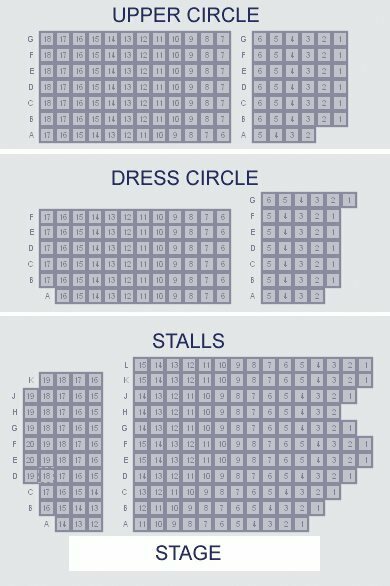 The Fortune Theatre has a capacity of 432 over 3 levels: Stalls, Dress Circle, and Upper Circle.